These are some of the most frequently asked questions we receive. If your question is not answered here please Open a Support Ticket. I just paid for a subscription but can not access the full manual, what do I do? This can happen if you have viewed the manual prior to logging in with an active subscription. The error message below may appear if you are seeing partial content. I just paid for a subscription but can not access the manual, what do I do? This can happen if you have been a member with us for a long time and have old cookies stored on your PC or if you tried to access a manual prior to completing your subscription. If you continue to have trouble, try accessing the manual through another computer or device. If all else fails please open a support ticket from your account page (login). I manage an ATV, motorcycle repair shop – how do I access all of your manuals for one low price? I bought a 1 Year subscription to a Cyclepedia manual. I like it so much that I want to upgrade to a Lifetime Subscription. How do I do this? Go to the url below, complete the payment information, and your subscription will be upgraded to a lifetime within a few business days. Feel free to open a support ticket requesting the upgrade be applied, once you have paid. Can I access Cyclepedia from any computer or mobile phone, anywhere? Once you sign up you may access your Cyclepedia manual from any computer, anywhere, which would be really handy for traveling. Plus you’ll get tech support and have access to all your service and maintenance records. Account sharing is not permitted. To protect your account – do not share your username and password with anyone. What does Cyclepedia tech support cover? As a Cyclepedia member you will be able to get support related to troubleshooting problems with your ATV or motorcycle. If you have technical issues using a Cyclepedia manual we can help you with that too. Can I print a Cyclepedia online repair manual? Yes. All topics can be printed for use in your garage or for viewing offline. Color wiring diagrams can be printed in full color. 1. Open the online manual and expand a chapter from the table of contents. Click on a help topic.2. At the top of the screen you will see a Cyclepedia toolbar. Locate the printer icon and Click on it (note, many newer manuals have a print this page link at the top of each topic). A printer dialog box should open. Please note that it is important to print topics using the Cyclepedia toolbar printer icon rather than trying to print from your web browser’s File > Print option. 3. Configure the printer options as you normally do. It is recommended that the page orientation setting be Portrait. Click the OK button to Print your pages. Your printer should print out nicely formatted pages. * Please note that printing the entire Cyclepedia manual may result in over 400 pages for some models. Note: Internet Explorer users may experience problems printing and getting images to appear in printed output. Google Chrome and Mozilla Firefox do not have this issue. Are Cyclepedia manuals available as a printed books? How do I activate the complimentary online subscription with my printed book? How long does it take to access Cyclepedia once I pay? Once you complete the payment process you should have immediate access. In some rare cases authorization can take up to 15 minutes. If you have any problems please contact us and we’ll straighten it out. Are Cyclepedia manuals pirated copies of factory manuals? We do not sell pirated ATV or motorcycle repair manuals – period. Every Cyclepedia manual is either a genuine publication produced by Cyclepedia Press LLC, content licensed to us or public domain works that meet pre-Berne Convention criteria. How do I login to my Cyclepedia Account? Do Cyclepedia manuals include wiring diagrams? Yes. Nearly all of our manuals include highly detailed, full color wiring diagrams. 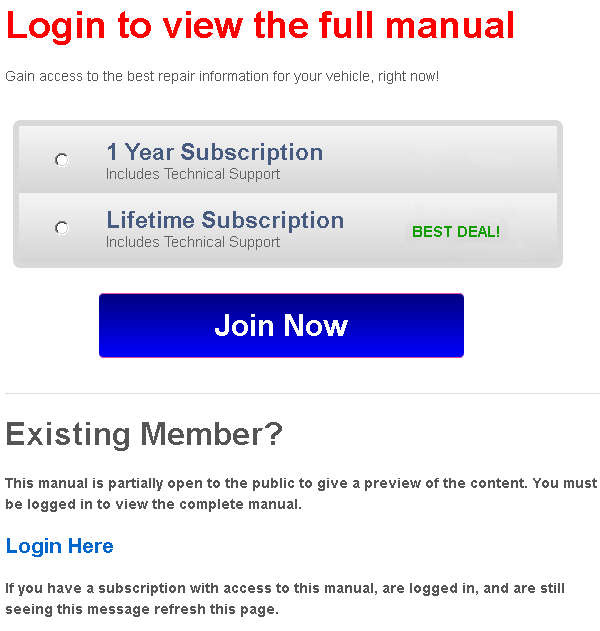 Every manual or service we sell includes a marketing page – please read what is covered by each manual before you buy. What web browser do I need to use Cyclepedia? Any modern web browser or mobile device should work with our online manuals. We recommend using Mozilla Firefox as it seems to work the best across many different platforms. Also, the most up to date version of Microsoft’s Internet Explorer will work well for online viewing, but may have trouble printing web based content. We do not recommend using propriety browsers such as those that come installed on HP computers and tablets. I have an old MAC computer will Cyclepedia work on it? You will be able to view our manuals from most PCs, MACs and mobile devices without the need to download any special software. Cyclepedia is designed to be read using the very same web browser you are viewing this page with. The benefits of our system are that you can view our manuals using most web browsers, with an ease-of-use and speed unlike any other manual you have seen before. If you experience any trouble we will work with you to resolve the issue or provide you with a refund if we are unable to remedy the problem. Will I be able to download PDFs from your site? Most of our manuals are not formatted as PDFs. We have found PDF’s to be clunky and hard to use. Our system is very easy to access in real time without the need to download and open a file. You can easily print any topic you wish. How can I be sure a Cyclepedia manual will cover the procedures I need to perform? I want to see a sample Cyclepedia manual before I subscribe. Can I do this? I sold my ATV. Do I need to cancel my account so it doesn’t automatically renew? Unless advertised as such, your manual subscription will not automatically renew. Once your subscription expires you will be sent a reminder to renew. If you do not renew it will become inactive and you will not be charged again. Some options you have with your existing subscription include transferring it to another manual or to another person. You may transfer your manual subscription to any other manual we have and use up your remaining time there providing there is more than 30 days time remaining on your subscription. You can also sell/give your login to anyone else and your account will be made inactive. We will need their complete info so that we can create a new account for them so they do not have access to your personal information. I bought a lifetime subscription to one of your manuals but I sold my bike. Can I change my subscription to another bike? We don’t swap out lifetime subscriptions. You can contact us if you want to pass on the existing subscription to the new owner with the sale of your vehicle. If you think you will be changing bikes often the best option is to get a one year subscription. We do allow for a one time subscription swap on one year subscriptions. Are you authorized by or affiliated with any of the OEMs? At the time of this update we are proud to have formal relationships with these prestigious manufacturing companies All Balls Racing, HISUN, KTM, KYMCO and Motoped. In connection to our business, namely the offering of manuals, we by necessity make use of trademarks and/or trade dress of others to describe the items we offer. In doing so, no representation of affiliation, association or the like is intended, unless otherwise stated. Moreover, we are in fact owners of intellectual property, property that is a valuable asset to our business. I need to cancel my order – what is your cancellation policy? User accounts that have been activated and accessed may not be canceled. This policy is to prevent abuse of our system. However, if you are unable to find the information you are looking for just let us know by opening a customer service ticket and one of our technicians will assist you. If you have not yet accessed your account you are eligible to cancel your account. All cancellations are subject to a 20% cancellation fee at the discretion of management. Are your manuals available in Spanish or any other language translations? Our manuals are authored in English. However, some free online tools can be used to view the manual text in other languages. We only offer support for the original text as the third party translations may be inaccurate. Use these tools at your own risk. Click here to learn more about using language translation tools with Cyclepedia.com online manuals.